Four different output forces provide for a more closely matched actuator/valve combination -- without over-driving the valve or exceeding its capabilities. Stroke Lengths of up to 50mm (PL550/PL1100) or up to 100 mm (PL2200/PL4400) allow actuator selection to match valve stem travel requirements. This provides exceptionally close resolution on proportional models. Manual Override allows for fast and simple manual positioning of the valve stem. 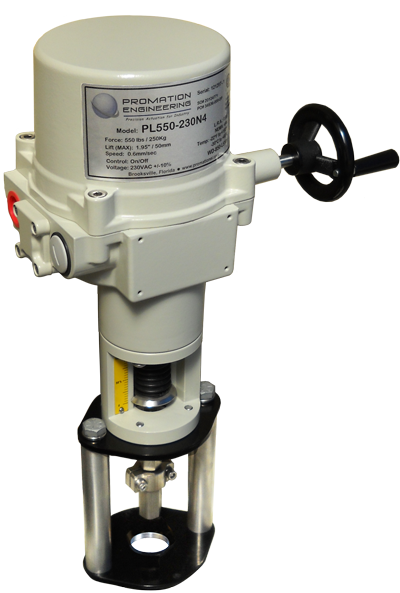 The handwheel is simply pushed in to engage the override system and disconnect electrical control of the actuator. External Stem-Area visual position indicator provides easily read and instantly available stem position. Stem Force remains constant even as valve seat surfaces wear -- no need for recalibration over time. Universal bonnet mounting is easily adaptable to most manufactured valves and dampers.